There's usually only one plant blooming in my garden in the middle of January and it's the dazzling Ozark witch hazel. It's blooming right now. I planted it in 2008 to memorialize my mother. (The Memory Tree) It's a lovely tree that all must pass on the way to the front door. A few years later I planted three more to create a small witch hazel grove in the Garden of Benign Neglect. The long dry summer was hard on them and bud set was low, but, there will be a few blooms later this month. The original Hamamelis vernalis arrived as a memorial gift from several dear friends who knew me well and asked me what native tree I might want! I knew immediately that winter blooming witch hazel was the perfect choice. It probably seems odd to choose a plant with witch in its name to honor my mother, but, it was a loving acknowledgement of her late bloom into a joy filled life. 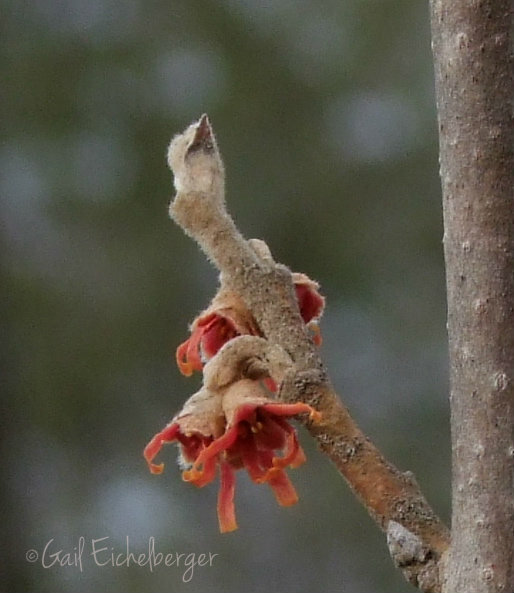 Ozark witch hazel blooms in the late winter and that was how it was with my mother. She bloomed in the winter of her life. She sold her house, let go of her old life and moved into a retirement village where she quickly made new friends and tried new activities. Her schedule was full and so was her life. When we phoned her she was often too busy to chat. We were all thrilled when Mom bloomed! Hamamelis vernalis blooms in the winter when we have just about given up hope that spring will ever arrive. On warm days those amazing orange/yellow/reddish crepe paper petals unfurl to perfume the garden with their sweet vanilla scent. When the temperatures drop they furl back up with the promise of weeks of blossoming. Their spidery blooms always make me smile. I think my mother would have laughed at my naming that first little Ozark witch hazel after her. In case you wondered, I call it Bernice. 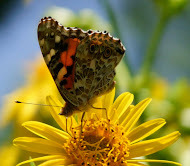 Now make this garden blogger smile again and pop over to May Dreams Gardens, where our delightful hostess, Carol, has set up the Mr. Linky magic carpet ride to take you to more Bloom Day posts than you can imagine. Even in winter! The best gardens are the ones full of memories! The witches are still in bud here. They haven't been fooled by this warmer winter. I think maybe because there have been days of below, ice and snow. That is enough to get your attention. All I have blooming are a couple of orchids. Better than nothing in January. Happy GBBD. What a lovely plant. And a lovely story behind it. What a lovely, lovely story. Thanks for sharing it for bloom day, Gail! Well this sounds like a perfect tribute for your late blooming mother! Do you know that I've never seen or sniffed a witch hazel in "person"? I need to remedy that, don't I? What a wonderful story and a great tribute to your mom! I remembered this story from the first time you shared it. I should at least try Ozark witch hazel. Somehow I think it would only be borderline hardy here, but anything that blooms so early is worth the gamble. I love witch hazel. What a lovely way to remember your mother. 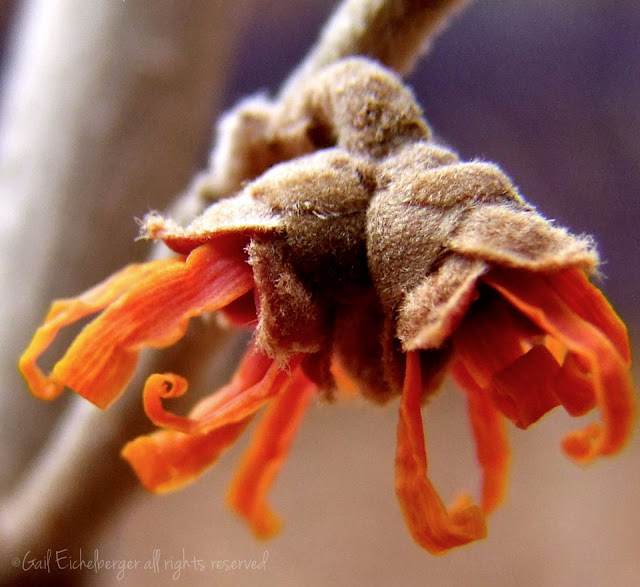 I got a witch hazel at the end of the summer and it is very small so I don't think it will be blooming this year. I'm hoping perhaps it will bloom next year. What a wonderful story, and what a wonderful plant to have in memory of your mother! love your photos; I don't have quite enough room to plant witch hazel in my garden so I go to the botanical garden to see them this time of year. A wonderful bloom for January! My brother lives in Franklin and we are always comparing the days/weather. What a difference. We were in the 70's this week. Just crazy. 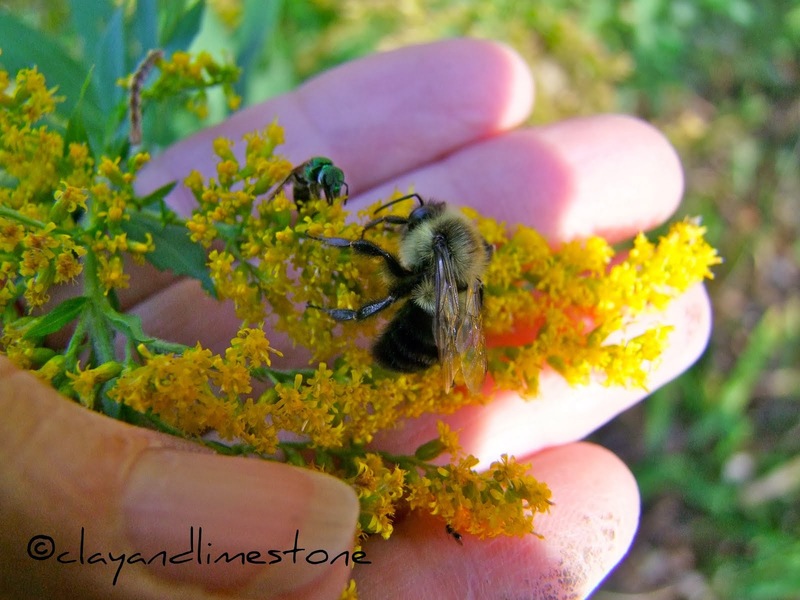 Beautiful post with beautiful photos- thanks for sharing.